As a family man, it is always a pleasure to indulge in a little fun when it comes to parenting. Thus when the offer comes to drive the new CITROËN Grand C4 Picasso MPV, it was just what the doctor ordered. As I had been thinking about switching my sedan ride to either a MPV or SUV to suit the growing family, the opportunity to test drive the latest MPV is simply too hard to refuse. Combined with a sporty outlook and practical features, this is one car that exceeded the expectation of a demanding Daddy in search of the ideal family car. Can one car really ignite a driver's passion and fulfill family needs at the same time? This would be like having the cake and eating it at the same time. An impossible thought? The CITROËN Grand C4 Picasso comes close. This was one ride that the WHOLE family enjoyed. Here are the 10 reasons why we think this Masterpiece is made for the family. When one mentions MPV, the image that would conjure is one massive , boxy , bland and probably odd looking vehicle given its configuration. In fact the words van and bus are often interchangeable with MPV. This is probably the reason why a practical MPV lies lower on the shopping list of a family guy compared to the more stylish SUV or the evergreen sedan. When my eyes first met the CITROËN Grand C4 Picasso ( a mouthful here so from henceforth it will be referred as the GC4P) , all the above preconceived notions about the image of the MPV are thrown out the window. The GC4P is no monster; it is a beautiful work of art . The car I test drove came in inviting Polar White. The colour compliments the styling of the CITROËN Grand C4 Picasso perfectly. Every curves and outlines were beautifully etched on this White Beauty. The CITROËN logo in front together with the slim LED clusters provide a futuristic grin that one would be delighted to meet in the morning. Fitted with a 17" avant-grade AQUILLION wheels, the GC4P looks proportionately build. It does not build like a beast but rather resembles a combination of French Flair and German sturdiness. This is probably one car that both a Daddy and Mommy would not mind being seen in it. The futuristic theme extends with intricate back lights that give a 3D effect when the brake is on. The badge Picasso is rightfully place on boot . This is indeed a masterpiece. Understandably , when one looks to purchase an MPV, one of the main consideration is size. After all it is the need for a bigger car that will drive one to the direction of an MPV. On the surface, the GC4P looks deceptively small to be in the class of a decent size MPV. Open the doors and you will be surprise by the acres of space within. This 7 seater would seat 7 adults comfortably , much less kids. The space is so generous that the children can climb in between seats if they were given a free rein(not allowed during rides ok ! ) . If given the green light, they would probably treat this car as their 3rd playground. The huge 7 seater would also equate to a lot of excursions with grandparents, cousins and friends. The Wackies are totally in love with the thought ! The great thing about the GC4P vs an ordinary sedan is the amount of storage space in the car. You may be thinking why we need so much storage space. For those with young children, you may be aware that a trip out usually involves a big tote bag filled with toys and goodies to entertain or distract the children. It would not be surprising to find an odd bag of chips or some Lego minifigures hidden in the car. With the GC4P's ample storage from the removable center console to the side pockets for passengers, these will come in handy to store those essential goodies. Just remember to clear them out once in a while. Since we are on the topic of space, the other deciding factor that most would consider for an MPV is the size of the boot. After all with a bigger family, it usually means the need for more boot space when it comes to a family outing. With all seven seats up, the boot space is limited to 2 gliders or probably 5 shopping bags full of groceries. The best test for space would usually mean a trip out to IKEA. This is where one could buy some furniture packed into flat-pack packages that are usually a tad too big for normal sedans. We managed to stuff an Expedit bookshelf and a Cupboard with length size up to 1.5 meters into the boot with the back row seats down. Initially we were really doubtful that it would fit, but to our delight ( and relief) , it did! And the upside to these entire boot space - No more transportation free. We seriously think that the GC4P is built with children in mind. Or at least they probably had a focus group with parents to decide what features would be useful for families with children. The GC4P comes loaded with useful as well as safety features to ensure a smooth ride for the family. Watch to watch an iPad? You have the fold down trays on the second row for that. Need a torch ? There is a detachable one on the back row. As for safety, the second row seats are fitted with ISOFIX . In addition, there is a small view mirror that allows the driver to keep a watchful eye on the back passengers. The GC4P also comes equipped with automatic height adjustable tailgate, a boon for those parents with their hands full of grocery bags and kids. When you are in a monstrous cabin with kids, the last thing you need is to feel trapped in a dark space. Rest assured this will never happen with the GC4P. The cabin feels spacious especially when the glass roof is exposed . Together with its extra wide panoramic windscreen, this would mean the whole cabin is bathe in light. Once inside, you would feel refreshing. No more claustrophobic rides with the GC4P. Oh, the glass roof is great for star glazing in the evening too. The only gripe, the glass roof does not open up. Then again how often do you see someone popping their heads up the car roof while driving? None... So I guess that settles the 'issue'. After oozing about the grandness of the GC4P, I guess by now you would be wondering how it drives. Before I proceed on my experience, there is one thing to note about MPV owners. Most had put speed and exhilaration below size and comfort when it comes to purchasing an MPV. It just does not make sense if you want a car to go from 0-100kmh in 7 seconds WITH kids in the car. Neither does cornering at 90km/h a norm for MPV drivers. With that in mind, the weakest link to the GC4P would probably be its drive. It is a semi-automatic car and this means the ride could be a jerky one as it shift gears at acceleration. However this would be mitigated in manual mode, whereby you can drive it using Sports car inspired paddle shifts . Pickup is much better with less jerkiness in manual mode. In addition, the GC4P comes with a gearstick located at the top of the steering wheel as opposed to the conventional gearstick in the center console. This takes a while to get used to, but once accustomed, it is actually quite useful as it allows quicker change of gears on the wheel. Seats wise, it is firm. I do wish it comes with sports seats for additional padding and comfort. Perhaps it may come as a face lift option in the future. Being one who loves to bring my children out for an adventure, the build-in navigation unit with maps for Singapore and Malaysia comes in quite handy. In addition, controls for several functions are on the wheel and the touchscreen media unit ( we will explore that further) . It is a boon if you can master it , but may be a tad difficult to handle while you are newly accustom to it. Oh did I mention that it has other features such as keyless entry/start, automated tailgate, telescopic & height adjustable steering wheel, reverse camera, cruise control, automatic headlights, electronic brakes and mood lightnings that are often found only in high end car models? And if you opt for the premium model which cost slightly more, you can more goodies such as front and back parking sensors, Park Assist with 360 degree camera, blind spot monitoring system. How that is a list most drivers would appreciate. All in all, the ride does not inspire me to be a speed demon , but with build-in luxuries akin to a limousine ride, it is a comfortable ride that triumphs over speed. For a gadget man like me , one thing that intrigues me is new technology. The GC4P surprisingly embraces technology with not one but 2 full digital full touch driving dual screen interface. It comes with a 7 " touchpad center console that controls most functions and a gorgeous 12" panoramic HD screen that hosts the GC4P information such as speed and fuel usage amongst others. For car control, it can be done via the 7" touchscreen . Car settings, phone functions, music functions, air conditioning and navigation are all at your fingertips literally. All these gadgets are a blessing for the technology savvy. Admittedly it does add up to the driving experience. However as with most devices, it takes time to master it. In some cases, technology may be a hindrance instead. 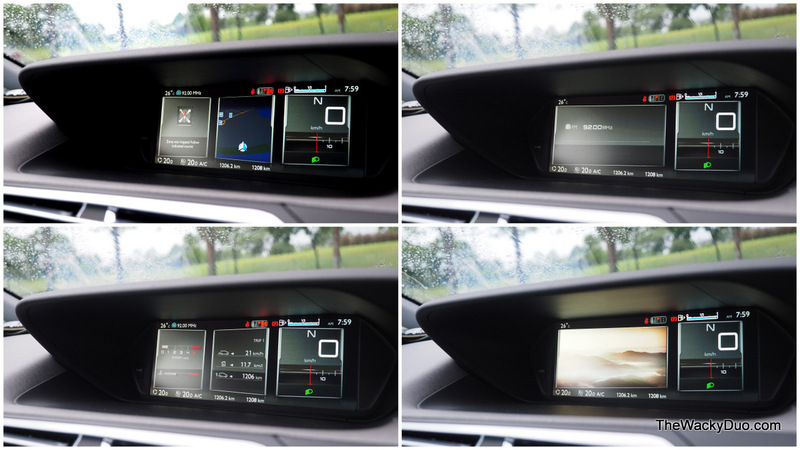 Take for example, the lowering of air condition functions will need at least 3 touches on the screen compared to a simple turning of the knob.as a result, It may mean less attention on the road. Nonetheless with familiarity, these short comings could easily be overcome. In addition , the C4 aims to bring the world of connectivity to the car. USB ports and 12 V sockets are found under the console , allowing you to connect or charge any iPhones, iPads or iPods.12 volt sockets are also back at the 2nd and 3rd row to charge your devices on the go. That means you can always stay connected even when you are on the road without the fear of running out of batteries. Last , but certainly not least is that this unit we drove had the fuel efficient 1.6 litre turbo- Diesel engine. This means greater savings with a S$15,000 rebate , reduced fuel cost, improved mileage and a special tax rebate of 40cents per cc per year. The GC4 is tested to drive at up to a whopping 25km/l. On top of it all, the turbo-diesel model comes with 5years/100,000 km warranty. This just meant one thing. More money saved for future education, toys and vacations for the family. Drives like a van , shapes like a bus, massive and boxy. Throw everything you know about a typical MPV , the above are not what the GC4P is all about. Honestly, prior to the driving experience, the CITROËN has never been featured on my wish list. However since this exhilarating weekend, the GC4P would feature near the top of it. It was love at first sight and after just driving it for 3 days; it has been on my mind since. The last time this happened, I married my wife. Could this be our next permanent ride? With Cat A COE looming at high $70k , this car is a steal at $150000 (as of April 2014). However with the supply of COE expected to increase by more than 30 %'in the coming months! There is a good chance of getting a better deal in the next couple of months. In the meantime, do take my review with a pinch of salt. Trust me, it will be better if you test drive one yourself. Who knows, it could be just the masterpiece that you have been looking for. Thanks for your car insight. I booked the car at price $118k with new automatic gearbox by aisin. The car changes gear smoothly. I test drove previous gearbox as what you said jerky. The ride, the looks of interior and exterior really hard to resist. My family loves it. Our car is ready for collection. I just received my new Citroen the blueHDI with EAT6 Gearbox. It was smooth gear changing. Yes, Citroen has changed to aisin gearbox full automatic gearbox. You are right, the Picasso has a lot of torque. I drove few adults in the car and the car has no sluggish at all. My family love the 2nd row space (my wife and children can easily walk from one side to another side and the beautiful moon roof. The dashboard is simple and contemporary. With japanese car cheaper by $10k-$15k, Picasso features like cruise control, speed limiter, pedal shift, moon roof, engine start stop, powerful torque of equivalent to a 3litter car, touch screen and dashboard display are more than enough for the additional cost. Not to mention the package I have listed below. The only thing I find not used to it, is the gear stick and auto handbrake. I keep looking for my conventional gear and handbrake. The rest is just superb and that is the only motivation for me to drive a MPV. As I am a sedan guy, having to drive a mid size MPV need some good gadgets for me to move over. Been comparing a few cars Stream, Wish, Peugeot 5008, Mazda 5, Touran. By far, Picasso looks modern and updated and most equipped. Wow, thanks again for your recommendation. I got mine April 2016 with package of 5yr warranty PLUS 5yrs servicing or 100k, car mat, umbrella, Citroen USB drive, Huper Optic solar film for whole car include moon roof, 1yr road tax (Diesel road tax is more expensive) and next 3yrs $300 reduction upon renewing of insurance and BlackVue DR650GW front and back 32GB micro SD. I never get so happy indulging in free gifts before.